Anything and everything about Liberty Flames football. Your comments on games, recruiting and the direction of the program as we move into new era. Jonathan Carone wrote: That’s the biggest issue with our logo: the letter mark isn’t good enough on its own, the secondary logo is a little too abstract, and together it’s too busy. I’d love if we could get to where we used the secondary on its own. One thing Coastal did that has worked well for them visually is drop the word mark and let the Chanticleer head logo stand on its own. I don’t know how well that’s worked from a marketing standpoint but it definitely looks better. 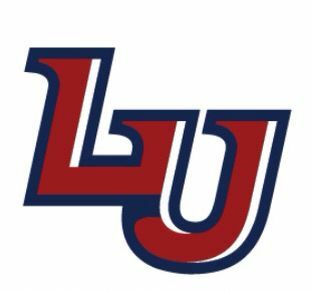 I don't think our monogram (LU standalone logo) is too weak to stand on it's own — I just don't think we quite have the tradition of athletic excellence yet. Look at the the first 5 logos on that list (ND, LSU, Auburn, Oklahoma, and VT). Those aren't necessarily impressive logos, they just provide a since of athletic excellence and tradition with them. LSU and VT's logo are far too horizontal and OU's isn't anything impressive. I like the 1:1 ratio that ND and Auburn have, though. While I'm very pro on athletic institutions rocking a wordmark and keeping the mascot logos to the professional sports (marketing purposes for both), I do agree that our new (2013) secondary logo is my favorite that the University (mainly in an athletic realm) uses. Weak may have been the wrong word for that because I definitely like the secondary the best. What I meant by weak is that, on its own, it doesn’t represent the word “Liberty” or “Flames”. It’d be like Alabama using the elephant logo as their primary. That’d be weak branding because it doesn’t represent “Alabama” or “Crimson Tide.” But put in the context of Alabama, it makes perfect sense. Likewise, our secondary logo makes sense when it’s on a jersey or hat, but would be weak branding if it was on its own on a list like what was posted earlier. Totally agree. That's mainly why I think Mascot Logos work best for professional leagues - 30-32 teams per league as opposed to all of the colleges/universities in the country. However, I do think the monogram is strong enough to stand on its own without the Eagle head. It's not that long standing Universities have amazing logos for the most part (as I stated above), we have just learned to recognize and respect them over time as they have succeeded. - September 5th, 2018, 12:53 pm #557396 I just don’t like our monogram. Haven’t since we launched it a few years ago. I’m admittedly picky since this stuff is my job. It could definitely stand on its own though. - September 5th, 2018, 1:03 pm #557397 Also - I just realized my first response was about the secondary and you were talking monogram. My bad on that. Some ODWho fan posted a video of Brickhouse "shutting down AGG" but you can see the flag fly in too. Half the team has started chirping at this dude on twitter. - September 6th, 2018, 11:15 am #557584 C'mon DJ. You're better than that dude. Our guys need to shut up and focus on Army. - September 6th, 2018, 11:29 am #557589 Thats worth a "c'mon man!" Also wanted to note for those that might wonder. This was just after kickoff. Really impressed with the quality of network. I don't get that in my house. - September 7th, 2018, 10:27 am #557676 yeah, at halftime the group I was with were all streaming different games on our phones without any issues. It was really a great thing and being someone who works in that industry I can attest that it is not an easy thing to pull off. There are a ton of things to take into account when installing wireless access points along with everything else needed to provide such high speeds consistently. Job well done by whoever worked on that project. thepostman wrote: yeah, at halftime the group I was with were all streaming different games on our phones without any issues. It was really a great thing and being someone who works in that industry I can attest that it is not an easy thing to pull off. There are a ton of things to take into account when installing wireless access points along with everything else needed to provide such high speeds consistently. 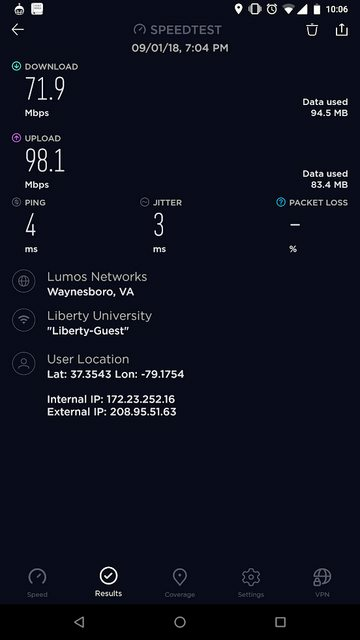 Yeah, those are great speeds. I'll be honest, usually when I'm on campus I disable WiFi because it hasn't been great. I'm glad to hear they've improved! - September 7th, 2018, 12:16 pm #557697 That gives me something to look forward to because i couldn't do much of anything in the stadium last time i was there. Did they upgrade the whole campus? BJWilliams wrote: That gives me something to look forward to because i couldn't do much of anything in the stadium last time i was there. Did they upgrade the whole campus? Just the stadium in this pass. 600+ access points added. BuryYourDuke wrote: So ODU just lost to Charlotte. Are we looking at another Baylor situation? Is ODU possibly the worst FBS team in the country? We will see. No, the Tar Heels are.